I hate to throw away food! I have even made a daily competition with myself in how I can re-use or make something new with already existing food in my refrigerator. I think it is something I learned from home in my parents restaurant. There is saying from some restaurant chef somewhere that in a restaurant kitchen, just as in your own kitchen, “your profit (or loss) is in your garbage bag”. A lot of truth in that… In general in Europe, we throw away about ~105 kg food per person and year. That means, that from everything that we buy in the supermarket etc, 19 % is immediately meant for the garbage (meaning ~155 euros per person and year)*. Insane! For me, taking care of left-overs and being creative in making something new out of it, is a way of showing respect to the complete food chain – the food itself, distributors and producers. So that’s enough for the bad conscience 😜 on a Sunday. Now, let’s focus on the fun part of this! A few days ago I came up with this really nice quiche. Including the leftover from the side dish with cauliflower leaves. A great win-win for 4 hungry persons. 1. Start with making the chia gel if you don’t have any already made in the refrigerator. Add 2 tsp of chia seeds to a bowl with a lid. Cover it with water,it should be about 2 cm above the seeds. Let is sit in the refrigerator. 2. Add the sunflower seeds to the food processor (must be absolutely dry). Run the mixer until you have a rough flour, then add the rest of the ingredients to the processor and run until even combined. It is pretty hard, don’t worry! 3. Add the pastry to a dry pie dish (no butter needed). Wet your hands and use your fingers to distribute the pastry even, you don’t want it to thick! When ready, lightly prick the base of the tart with a fork. Leave in the refrigerator for 30 min. 4. Set the temperature on the oven for 175º C. When warm, place the pie dish on an oven rack. Set the timer for 10 min. Don’t let it become too dark! 5. Beat the eggs in a bowl and add the coconut milk, salt and pepper, mustard and chopped dill. Mix it well. 6. Take out the pastry and add the already prepared vegetables. Add the smoked salmon in pieces above. 7. Pour the mix of the eggs above the vegetables and place again the pie dish in the oven. Set the timer for 45 minutes. 8. 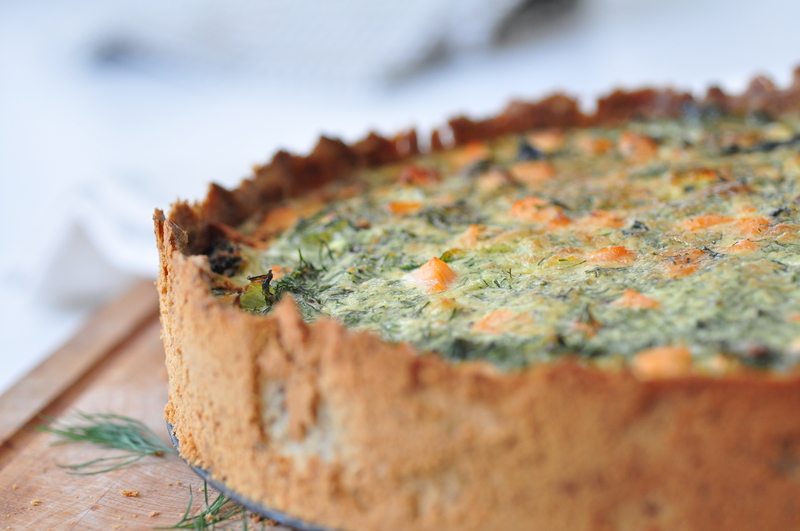 Enjoy your quiche with a nice dressed salad and maybe a glass of wine.